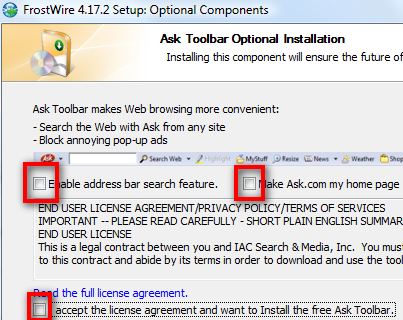 For those who are still using LimeWire, you should really switch to Frostwire. FrostWire is a Peer to Peer (P2P) information sharing client for the Gnutella network just like LimeWire, supports torrents, magnet links plus built in community chat. FrostWire is actually a fork of the LimeWire source code. There’s no difference in terms of search results as Frostwire returns the same results as LimeWire. It’s an open source project, runs on Java and hosted on Sourceforge, and is available for Windows and Mac. It’s free. No ads. And no RPO version that Limewire makes you pay for. 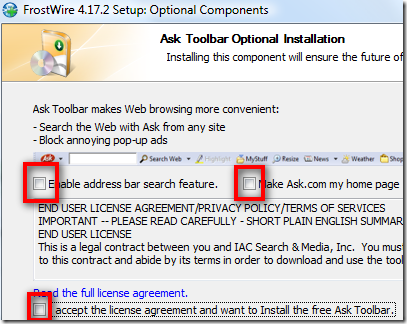 Just be a little bit aware that Frostwire will prompt to install the ask.com toolbar during installation which you can easily opt out from. Apart from that, my user experience has been positive. Please share your comments. I don’t judge how good or bad a software is by looking at its version number.